Ha-Yang Kim’s TERMINALS is a full-length meditative audiovisual work on the peripatetic quality of contemporary life; arrival and departure points, the constant states of flux both in exterior locations and interior realms, sojourns through dense cosmopolitan urbania to vast natural landscapes, the extreme degrees of human connection-communion-discord-solitude. Through contrasting seamless sections of sonic and abstracted visual environments, TERMINALS is a contemplation upon the transitory fleeting nature of time, motion and stillness; illuminating the rich moments experienced in between the larger overlapping arc points, thus, the simultaneous vast and intimate spaces which comprise the journey itself. The work is composed specifically for frequent music collaborator Hahn Rowe, and video artist Ursula Scherrer. NYC-based Korean-American Ha-Yang Kim creates new music as a composer and cellist, regularly collaborating with ensembles and artists at festivals and diverse performance venues throughout the world. Drawing from a breadth of western classical music, American experimentalism, rock, electronic, noise, avant-improv, to non-western sources (Balinese, South Indian, and Korean), Kim’s music is inspired by acoustic phenomena, ritual ceremonial processes, and characterized by an organic visceral lyricism of sound influenced by the East Asian sense of space and emptiness. 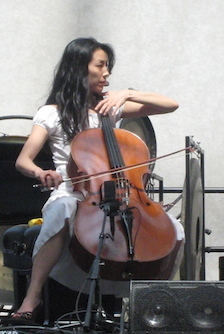 Kim developed a unique signature language of extended string techniques and has also composed music for film, theater and multi-media. Performances throughout the US, Europe, Asia, Russia, Turkey, Morocco, Bali, Cuba, Canada. AMA, a monograph of her compositions is released on Tzadik. Her latest album Threadsuns, featuring a composition for string quartet and performed by JACK Quartet, was released on Tzadik in March 2014. She composed the original score for the documentary film, DIOR AND I, which premiered at the 2014 Tribeca Film Festival to critical acclaim. Ha-Yang Kim: TERMINALS is made possible with support from the Jerome Foundation. The Jerome Foundation, a long-time supporter of young composers, was a mainstay in Roulette’s early development and continues to help us fulfill our mission by presenting ambitious work by promising artists. Each year, the Jerome Foundation supports five artist residencies and four commissions at Roulette. These artists are consistently some of the strongest in our repertoire, and we are delighted to honor the Jerome Foundation’s 50th Anniversary grant. Ha-Yang Kim & Hahn Rowe from cairos on Vimeo.